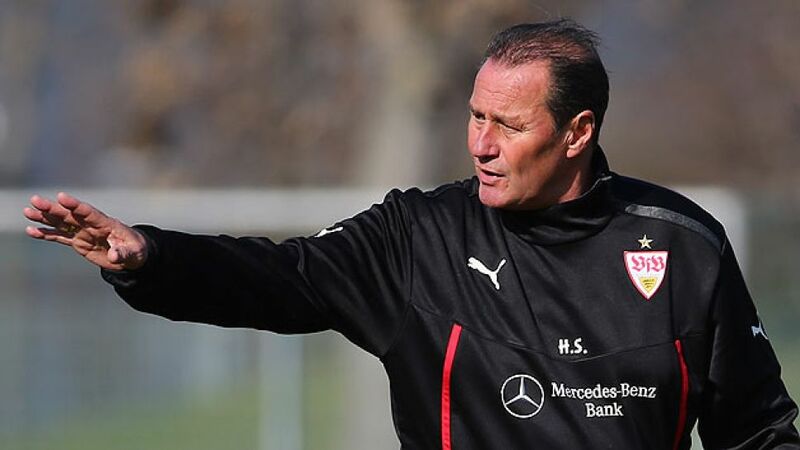 Stuttgart - “It's a minute before high noon and there's a lot of work to do.” Those were the words of Huub Stevens at his official unveiling as new VfB Stuttgart head coach on Monday (10 March) at the Mercedes-Benz Arena in the Baden-Württemberg capital, and when it comes to work, the 60-year-old Dutch tactician is something of an old-school specialist. Stevens has been parachuted in to turn around a disastrous form slump which saw south-western Germany's biggest traditional club endure an unprecedented eight-game losing streak, which finally came to an end last weekend with a 2-2 home draw against Eintracht Braunschweig. That result was a further psychological blow in itself, with an 82nd-minute goal earning the bottom-placed visitors a share of the spoils and maintaining the gap between the sides at a mere three points. It also marked the end of former U-17 coach Thomas Schneider's 21-game tenure in the hot seat, and the appointment in his stead of Bundesliga old hand Stevens on an initial contract through to the end of the season. As far as experience goes the native of Sittard, just a couple of miles from the German border, even squeezes into the Bundesliga coaches' all-time top 20 with an impressive 336 games under his belt. Two stints at FC Schalke 04 account for the bulk of those (239), alongside which he had spells in charge of 1. FC Köln, Hertha Berlin and Hamburg. It was in Gelsenkirchen, though, that he achieved the most success, winning the UEFA Cup in 1997 – at the end of his first season in charge – and back-to-back DFB Cups in 2001 and '02, in the process earning his place on the touchline as the Schalke fans' ‘Coach of the Century’. To that end, he said, “I'll be talking one-to-one with all the players, that's necessary for yourself and for them as well.” He has already made a start with his predecessor Schneider, a long-term VfB staffer and proven youth team specialist, whom the VfB management have stressed they are keen to keep on at the club in some capacity. “Thomas was there in the dressing room for games where we weren't. I'm grateful to him for being helpful - obviously I'll still be doing my own thing,” Stevens explained, adding that, “I feel sorry for Thomas, but that's how it goes in this business.” As to how it might go on his own Stuttgart debut at Werder Bremen on Saturday, a clean sheet would certainly help for starters. VfB have not managed one in any of their last 17 league outings, and have actually let in two goals or more in each of their last twelve. That can only be anathema to the man associated above all in the German game with the mantra, “First-off, you don't concede.” His teams have managed to keep him happy in that regard in 121 of those 336 matches to date, giving him one of the best clean-sheet quotas in the history of the league. As far as Stuttgart's current defensive frailty goes, though, Stevens was not being drawn on specifics at his first press conference. “Every aspect needs to be worked on,” he said, “I saw some good things (in the weekend draw with Braunschweig), and it's too early to be talking about changes to the system. I've cancelled the day off, so as to get to know the players. Otherwise, I've lost another day.” As he said, there is a lot of work to do.